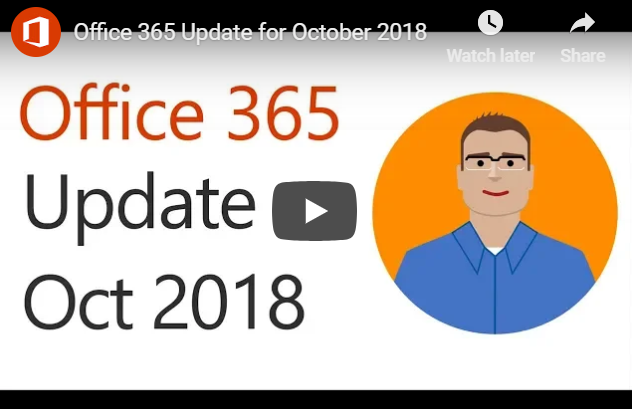 What’s new in Office 365 for October? What’s new in Office 365 for October? It looks like, in October, there’s a lot going on, with your Office 365 Home or Office 365 Personal subscriptions. We know some of you are reading this do subscribe to one of Office 365 consumer plans. It’s great news if you fit that description and you have more than one device at home. Check out the latest updates to Office 365. ﻿ What’s New For Office 365 Home or Personal Subscriptions? Office 365 Home and 365 Personal subscriptions use to have device install limits. Office 365 Home limited subscribers to 10 devices in total, across five users, and Office 365 Personal, limited subscribers to one PC or Mac and one tablet. As of October 2nd, subscribers are permitted to install Office on an unlimited number of devices. And can be signed into their accounts on up to five of those devices at the same time. And, for those with more prominent families, Microsoft increased the number of licenses in a Home subscription from five to six, with no change in price. To be clear, that’s six people with their Office license and 1 TB of OneDrive cloud storage each, for a total of 6 TB. What’s The News About OneDrive Files On-Demand for Mac? Microsoft announced at Ignite 2018 a preview for an enhancement to OneDrive called Files On-Demand. That enhancement has been available on Windows for a few months. For Mac, Files On-Demand makes it easy to have access to all your files. But only have the data you need to be stored locally on the device, thereby reducing the amount of local storage space consumed. The way you work doesn’t need to change. That’s because in Finder all your files are accessible, allowing you to work as you do with other data on your device. Files On-Demand is available to consumer and commercial OneDrive customers, and works across all your personal, work, and shared folders in Office 365. Status icons in Finder, make it easy to know whether your files are locally available or online. You can easily create files or folders always available, even when you don’t have an Internet connection, by right-clicking and selecting Always keep on this device. Files On-Demand for Mac is currently available for Office Insiders on macOS Mojave. It gets enabled by running a simple script. What’s The Latest Information On Super Zoom? The new Super Zoom feature enables OneDrive on iOS users to use a pinch gesture. With the pinch gesture, you zoom in and out of the Photos view. Zoom out to easily scroll many photos at a time or zoom in to get a more extensive preview of your pictures as you browse. This feature gets supported on both OneDrive for Business as well as consumer accounts on iOS. For those of you using OneDrive on Android devices, Super Zoom is already available, but only for OneDrive consumer accounts and should be coming to OneDrive for commercial accounts later this year. Did Word & PowerPoint Get @mention To Tag Someone For Feedback? When you use what is commonly known as the “at” sign with someone’s name in social media apps like Twitter or Facebook, the person you mention receives a notification about that post or comment. Now you can use @mentions in Word and PowerPoint to draw someone’s attention to comments in a document or presentation when you’re collaborating. Just add the @ sign, then type the name, of and the person from your organization; who are working with you. That particular person receives an email, with a link directly to your comment. Clicking the link brings them into the document or presentation and the conversation. Using @mentions in Office can help take the lag time out of the collaboration process helping you get more work done, faster. The latest updates to Outlook for Windows is the “Coming Soon” feature. That new functionality getting introduced to Outlook for Windows gives Office insiders a window of time to try new features on their schedule before they are released more broadly. One of the new features being showcased using the new Coming Soon features pane are the new Simplified Ribbon. It lets you focus on the core of what you need, displaying a single row of commands versus the three lines of powers in the classic ribbon. It is still easily expandable, so you’re always in control. The default set of commands in the simplified ribbon are those used most frequently, and less commonly used commands are always still available with just a click or two. In addition to the Simplified Ribbon, Microsoft made updates across the entire mail and calendar experience to improve productivity and keep you more organized. What Got Added To The Power BI Built-in Report Theme Options? Most Office users are familiar with applying themes in Word, Excel, and PowerPoint to give your content a consistent set of fonts, colors, and effects. The Power BI team recently added the option to apply new built-in themes to Power BI reports, similar to what you can do with Word, Excel, and PowerPoint. You’ll see these more modern theme options by selecting “Switch Theme” in the Home ribbon in Power BI Desktop. What you’ll need to do is pick your desired theme from one of seven new options, and it does apply it to all your visuals that use the default color palette. You can also find a link to the report theme gallery in the same place which contains additional community-developed themes. This update also includes a preview of a PDF file connector that lets you access table data in PDF files, a preview of IntelliSense support for the M language used by Power BI, and a lot more. What Is The New SharePoint File Template Management? SharePoint has been at the heart of document-centric collaboration since long before Office 365 existed. SharePoint content types are essential to Microsoft’s vision of how they will continue to deliver content services innovation in Office 365 and by extension, Microsoft 365. Now you can add document templates to SharePoint document library content types. Microsoft also added the ability to edit the New menu – to add, hide or reorder the new file options. With this new capability, you can maintain the default templates for things like Word, Excel, and PowerPoint along with any newly added templates and content types specific to your requirements. Configuring the New menu is easy. Select (or deselect) which templates you wish to see and by using drag and drop to re-order the templates in the list. In the Office client, you can edit the template directly. You can change the template’s content type or delete the template. While scoped to a single document library, for now, Microsoft will expand these capabilities to allow you to distribute and publish content types, with associated templates and metadata definitions, to multiple site collections and libraries in a single transaction.